Info "Swap letters to create the right word." Chain Letter is one of WarioWatch's microgames in WarioWare: Twisted! The name comes from the e-mail term "chain letter". 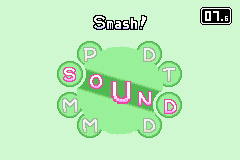 The purpose of the game is to tilt the Game Boy Advance to choose the right word, then to press the button to enter the answer. If the answer is right, the game is won. 1st level difficulty: There are two words to choose from. 2nd level difficulty: There are three words to choose from. 3rd level difficulty: There are four words to choose from. This page was last edited on September 27, 2018, at 18:45.